Discussion in 'Scheduled Matches' started by Lanzer, Apr 1, 2017. "The Vlka Fenryka had a long standing tradition in fighting Orks since the dawn of the Imperium. It was no surprise to see them on Arkhona, heading to the Medusa Relay to fend off another savage assault of the Orks. They were surprised when the Dark Angels chapter arrived to make hast for the same Relay. Tradition would have asked for both parties to provide a champion for the age old duel (some call it more than just a mere feud) between the two chapters, reenacting the fight between the Wolf and the Lion. Times were desperate and the Orks too close to indulge tradition. An alliance was made. Both parties shared the same hatred for xenos and had the same pride to be the first in battle. 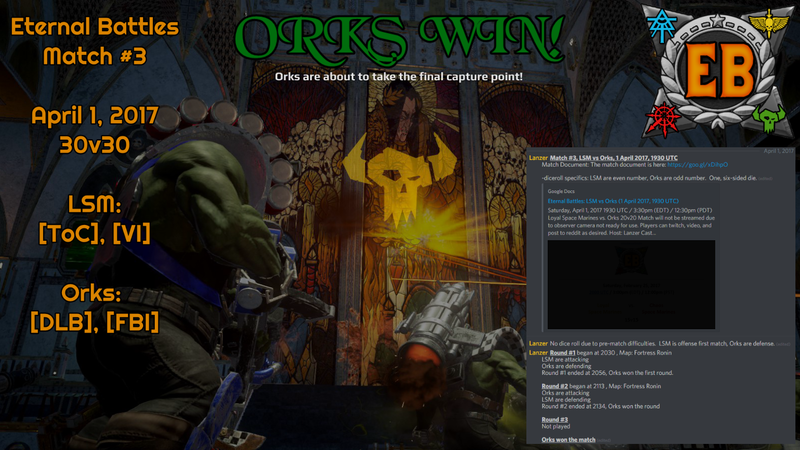 "I pity the Orks, for they know not what comes their way." Eternal Battles is hosting Match #3 on Saturday, April 1, 2017. Thana, DongSlayer, KroozaNob and 4 others like this. How near are we from having casters to show us the battle? Within the next two fights. We have tested the camera and currently figuring out how to integrate it into our future matches. PROPPA FIGHT ALL 'ROUND LADS!!! DIS IS WHY DA WARHAMMER 40K COMMUNITY IZ DA BESTEST! Houngar, Khornatian, DJPenguin and 7 others like this. "but the Orks, unpredictable as they ever were, had other plans..."
"A mighty Lead-Belcha warband, led by a Warboss of great renown, had heard of the battle for medusa, and more importantly, through his gretchin spies, of the great space marine host headed to relieve the beleaguered defenders there. Leaving the great mountain fortress of Ronan relatively undefended, the warboss, having seen the angels of death in battle many times, decided to test them there, gathering small bands of Freeboota's and feral Ork tribes along the way to supplement his own force." this massive movement of Ork assets did not go unnoticed by the Vlka Fenryka for long, as they had many scouts themselves in the surrounding icy wilderness of that mountain citadel, soon, the relief of Medusa was called off, to the detriment and ultimate doom of the forces stationed there, as the Ecclisiarchy demanded the fortress's full-defense, as it contained many valuable relics, several of special importance to the Space wolves stationed there, coaxing them and there allies to rush via-thunderhawk to the location, just in time to meet the first Wave of Ork shock-troops as they used a collection of power claws to rip the gates apart at the seams." the battle for Ronan had begun, and with it, a battle of will, between man and Ork, a battle as old as time." Khornatian, No_1, Thrakka and 4 others like this. just covering a bit of a lore blunder, as the original post described the wrong map, we had this weird phase where the communication broke down and we couldint find out whether we were playing on ronan or medusa till we actually loaded in, it was ronan. Well Played Thrakka, Thanks for coming out and throwing down it was a lot of fun hope we can do it again soon ! !